Last week, we saw how Armored Board was not entirely happy with the T40 medium tanks which they had received for testing. 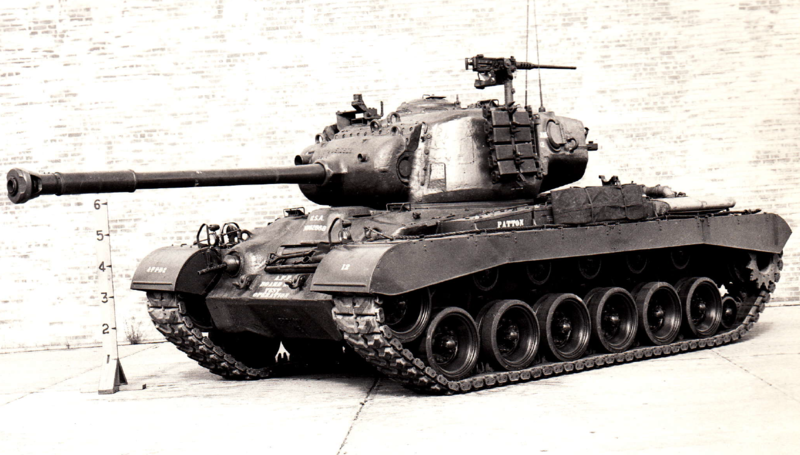 Bearing in mind that the M46 entered production before Armored Board had even started testing T40, the testing was as much just to prepare Fort Knox for things to keep a particular eye out when they finally did get some M46s to play with. Some defects had been noticed by Aberdeen before Fort Knox received the vehicles, and some modifications incorporated. Some. M46 #12 as it arrived. This tank survived the testing process. Note the name painted on the side. These new M46 tanks showed up in the very beginning of 1950, Fort Knox immediately ceased the T40 testing program, parked the four vehicles, and set about the four M46s they received. The first thing they did was break them in gently, running about 200 road miles, and not exceeding 2,200 rpm. Then the testing started. Over the course of the test, the four tanks ran the following distances. So, a reasonable testing period, with over 2,500 miles on the clocks of two of them by the time all was said and done. There were a number of comparison tests done between M46 and the M26 predecessor, with, in most cases, M46 performing better than M26. Three tests were performed. One was a simple, practical, “At various speeds, how much room does the outside track need in terms of turning diameter?” The figures were pretty close, with, for example, at 10mph, 76.3’ diameter for M46, and 73.5’ for the M26. Of course, M46 could neutral steer, which was a definite plus. The second test was a 500 yard slalom, with flags to zig-zag around spaced 25-50 yards apart. The difference in time was 1:42 for the M46, 1:52 for M26. From the report: “No steering deficiencies were noted in operation of either vehicle during this test. The difference in time required to negotiate the course was due to the higher speed attained by the Medium Tank M46”. So far so good. The third test was the “winding roads” test. Seriously, that’s the official name in the report. The course was a 2 ½ mile “winding gravel road having numerous sharp curves”, and an average grade of 3%. They timed the tanks going up, and going down. This is probably Army understatement in operation. 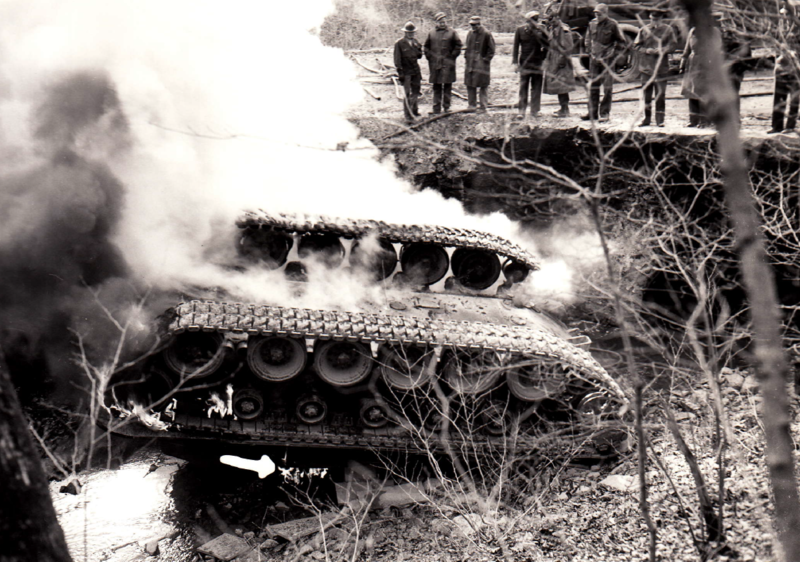 It was apparent not least because M46 #21 failed to make one of the turns, fell off a bridge, rolled over, immediately caught fire, and burned. This may have been a clue. The date was 16 March 1950. Tank 21 did not survive the testing process. Even the gun tube bent. Curiously, the transmission was repairable. They got another M46, ran that downgrade, but got a slower-than-M26 time of 6:47. 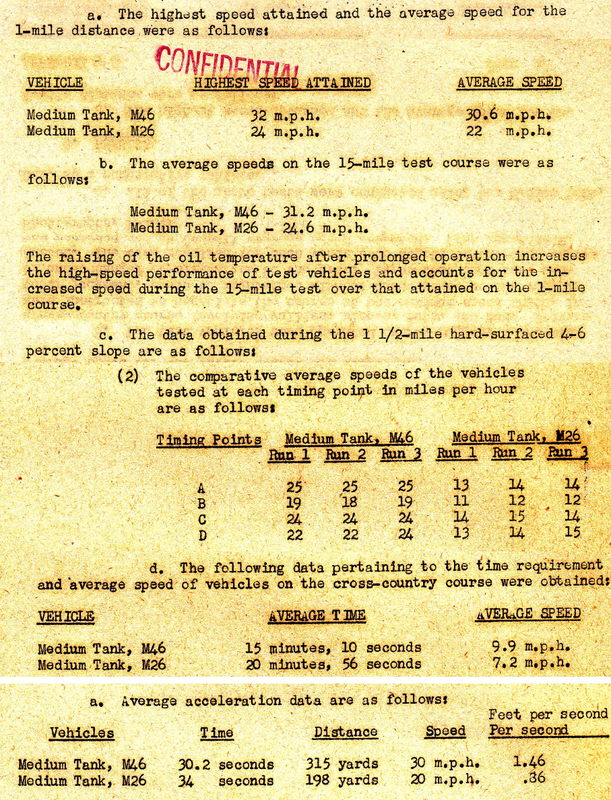 This was explained by the report as follows: “In order to insure(sic) safe operation, the Medium Tank M46 was unable to take full advantage of its maximum speed when going downgrade, due to the extreme caution which had to be exercised by the driver to attain proper relative engine and vehicle speeds.” Given what happened the other tank, the extreme caution is understandable. This was only a problem going downhill; when travelling under full power upgrade, there was no issue. Remember that the crossdrive transmission conducts its steering mainly by use of power application, more than brakes. The driver’s immediate actions were first to rev the engine in order to increase the ratio of engine power to vehicle speed, then tried the brakes. Neither course of action worked. The driver was in such a state after his incident that he failed to pull the fire extinguishers before exiting, which was understandable from his perspective, but not necessarily helpful to the investigation and test process. There was a second problem identified at high speeds, that the vehicle had a tendency to oversteer. The sensitivity was such that when attempting to make a minor change in direction, the driver would inadvertently overcorrect, requiring additional correction, with the effect that the tank would fishtail down the road. A modification to the transmission fixed that one, though. 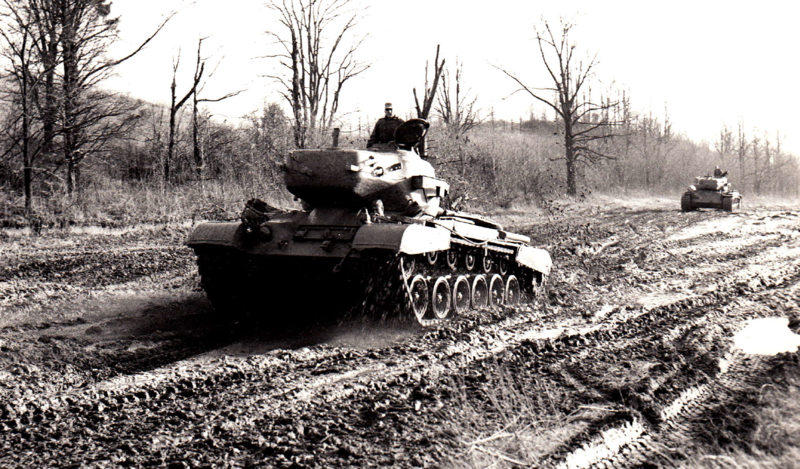 This one certainly came into M46’s favour, with the tank stopping from 20mph in 25’1”, and 30mph from 48’6”. The M26 stopped from 20 in 43’6”, and didn’t make it to 30mph. Even at 10mph, in reverse, the M46 stopped in 6’ less distance, 8’1”. During the course of the brake testing period, the brakes on M46 #34 failed as it approached a bridge at a curve. It failed to make the turn, fell off the bridge, rolled over, immediately caught fire, and burned. This was 15th April, 1950. Brake testing apparently failed. And then there were two... Down to half the fleet now. This was during an uphill run, so the same steering issue as the earlier tank was not considered to be a factor. Post-accident investigation indicated that a brake application strut had fallen out of alignment, and that application of both brakes actually resulted in application to the left brake only. An earlier such deficiency had been noted on another tank, with less dramatic consequences. 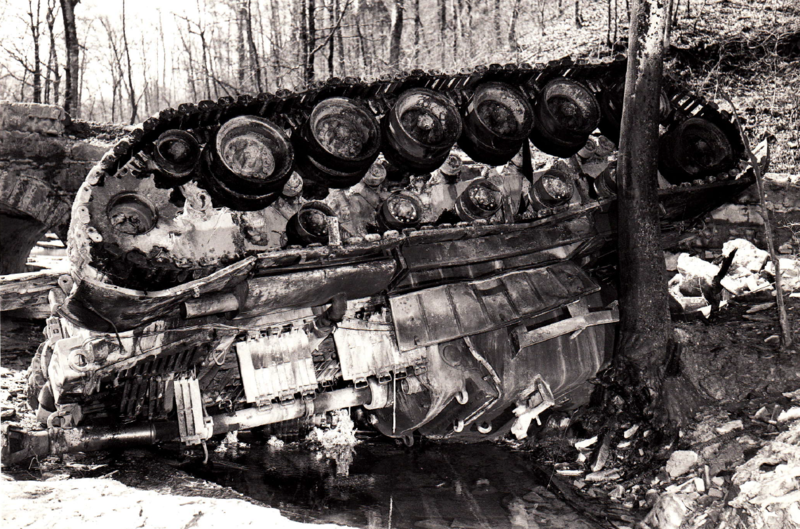 A memorandum in May to the Chief of Army Field Forces described the fact that both vehicles immediately burned when overturned as “quite disturbing.” In fairness, upside-down is not a naturally occurring position for a tank, and it is not incredibly surprising that the designers didn’t make much allowance for it. The conclusion was that the fire was started by oils falling from the auxiliary motor air cleaner being ignited by the external exhausts, and things went from there. 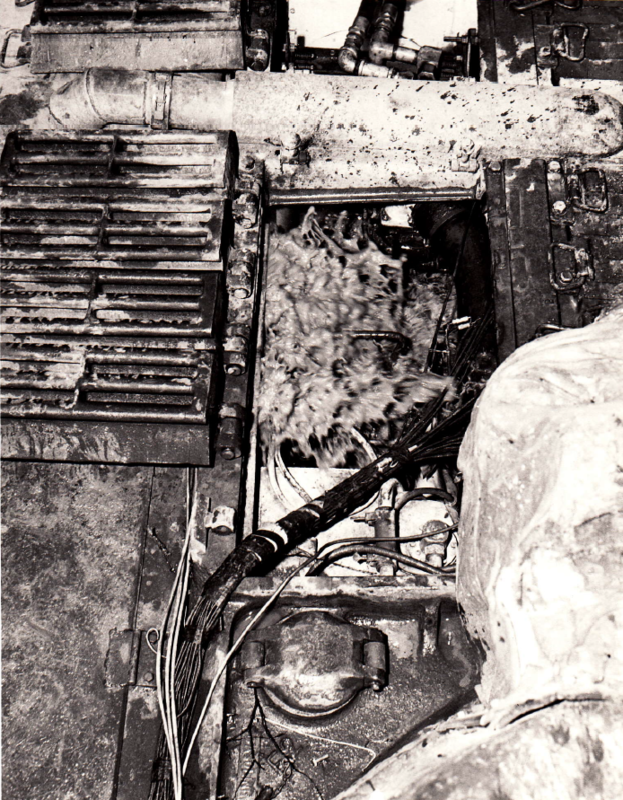 This fire, fueled by additional leaking hoses, burned away the seals of the gas tank caps, resulting in the petrol then feeding the flames, and thus consuming the rest of the tank. Both M26s made it to the top of the slope in about two minutes twenty. The M46s got about this far. Doubtless the hearts of the evaluators stopped. Fortunately, it turned out that it was just oil from the engine crankcase finding its way into the fuel system at angles. 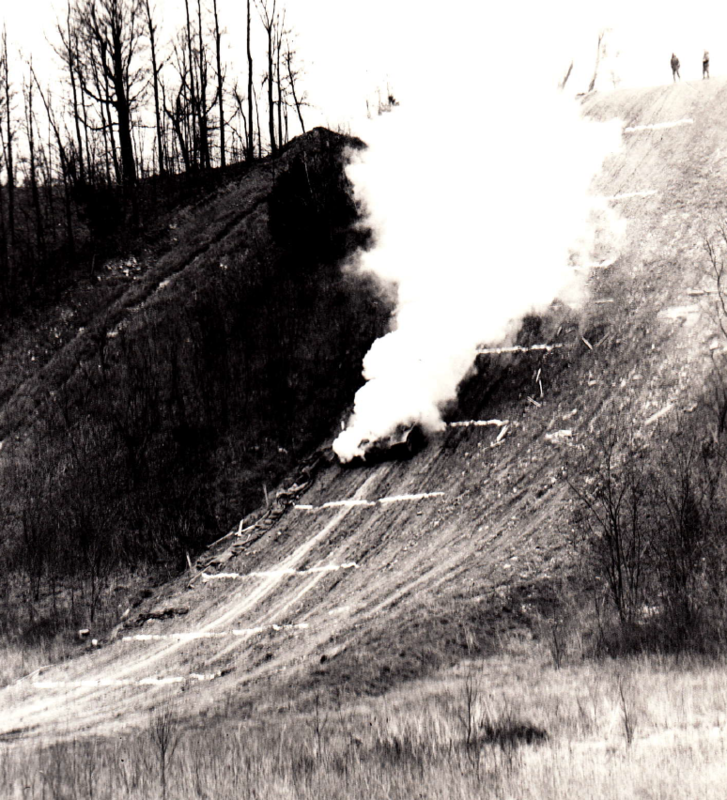 However, the root problem still remained: The tank couldn’t get up the hill due to a lack of power. 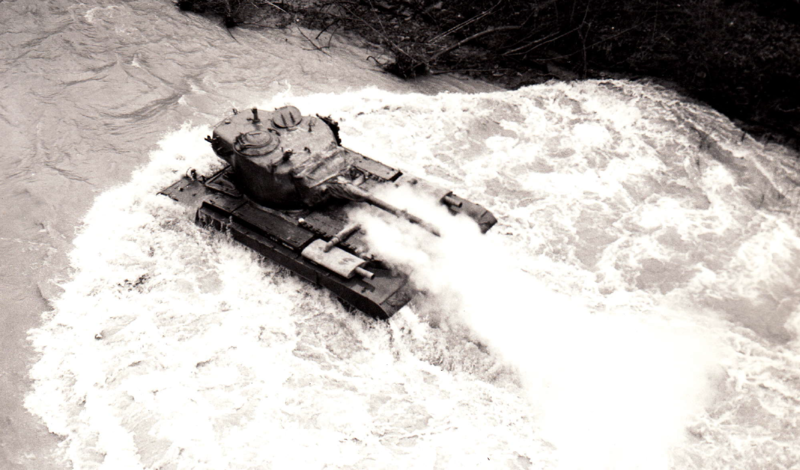 Possibly with some relief, given the amount of smoke and flames which had bedeviled the testing to that point, the Board took the tanks down to a creek with a depth of up to 48”. The tank wouldn’t catch fire there, would it? Well, no, that’s just steam. In fact, it turned out that though the tank did continue to operate, it leaked a bit. Some 2’ of water entered the tank, so the driver got a tad damp. The lubricants got washed off the engine generators, water got into the air cleaners and lubrication some of the running gear wheels, and there was quite a bit of turbulence around the auxiliary motor, but other than that, the tank seemed to run fine. 5) Mud driving. 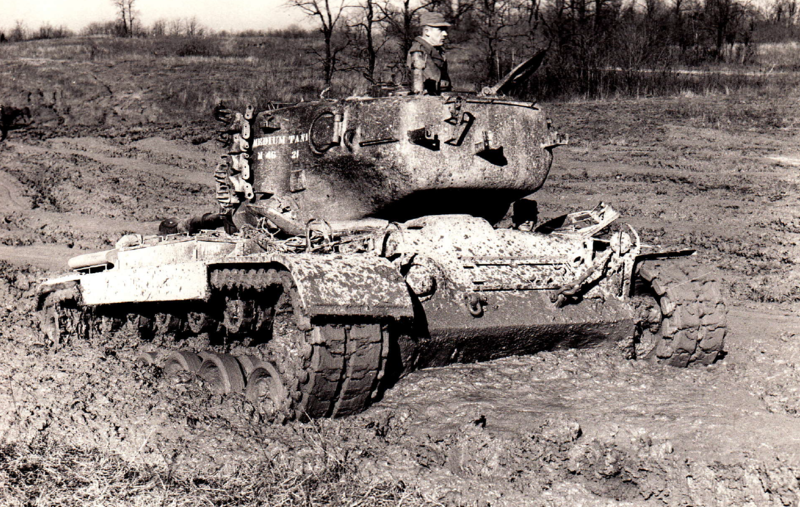 Between 12-40” of mud was tried, with both M46 and M26 performing about the same. Both tanks bellied out in the mud at about 40” and got stuck. 6 & 7) Maximum speed and acceleration. Who doesn’t want to drag race tanks? (I’ve done the same in Abrams). M46 leads the M26 in the cross-country race. This was a more subjective test, they just drove around in the dark to see how easy it was. There were a couple of quirks with the headlights, but the biggest concern was that the exhaust pipes and mufflers glowed in the dark, and could be seen at 500 yards with the naked eye, and 700 yards with hand-held infra-red. (Remember, this is 1950. IR technology was not particularly new). Test 9 was an observation of the power system, and it generally passed, barring the lack of torque as evidenced by the inability to climb the grade. Test 10 is driver comfort, a favourite of mine. This was, again, a subjective test, with opinions being sought. One issue was the relative position of brake and accelerator pedals, which was rather inconvenient and apparently not fixed by the M47. Tall drivers in particular were not happy given the fixed seats, and nobody was happy that there was no support for the driver, meaning that he got thrown around as the tank bounced over rough ground. 11) Fuel and oil requirements. All in all, there was a 9-page list of deficiencies, which you can see here. Fort Knox estimated that they were getting 3.7 miles to the man-hour of maintenance, mostly related to the oil cooling fans. Attempts were made to fix the cross-drive transmission to allow it to steer correctly, but it would end up that only a complete re-design at the factory would manage it. Fort Knox was in two minds about issuing the vehicles out, even with the caveat that they be limited to 12mph in convoy operations. They wanted more field testing, and they wanted better tanks than M26, but on the other hand, there was a concern that if the M46 was released to troops in its then-state, that the troops would become prejudiced against M46 in all forms, even after the tank was fixed. Again, it is worth recalling that M46 at this point is being churned off the assembly line. A letter dated 24 April 1950 indicates that if they wanted to get a particular change in the steering mechanism into the 500th M46, they had better tell someone by the 1st of May. Now, this was obviously not the end of the testing. Field testing did continue with a line unit after this, the results of which I do not have. However, it is clear that one of two things happened as a result of this initial testing: Either several hundred M46s were converted and left sitting around waiting for a fix to be developed before being issued to troops, or a couple of battalions’ worth of somewhat dodgy M46s were sent to the force. 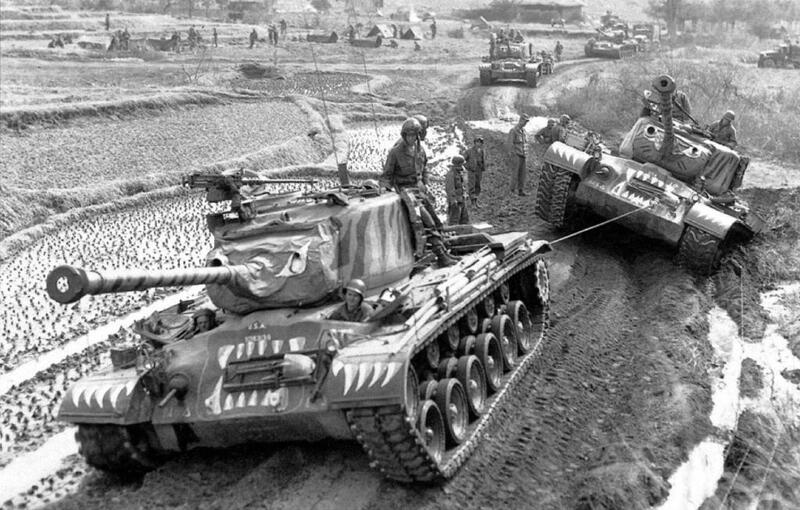 Given that the M46(New) with the improved brakes, cross-drive transmission and a few other changes was scheduled for production in April 1951, and M46s entered combat in August 1950, it is evident which way the Army went, given the pressures of the Korean War. It would appear that the forces didn’t find too many 60% grades to fail to climb up, and there aren’t too many references to tanks falling off bridges so maybe they simply kept convoy speed down. Given that M46 was a general improvement over M26 as long as those two situations did not occur, it is unsurprising that overall the tank was welcomed. For the forum, it would appear that Bob has rolled over, caught fire, and burned, so just click http://forum.worldoftanks.com/index.php?/topic/487331-patton-troubles/. As ever, my Facebook page remains here, my Youtube channel here, and Twitch stream (Every Tuesday at 4PM Pacific, and (very) occasional late evenings) is here.